Ukraine is currently in play in the world political soap opera. Like Syria and the nations involved in the "Arab Spring" movements, the story involves a not-completely-horrible government under fire from violent rebel forces which are at least partially puppets of the USA (and its Thief-in-Chief). The prize, at least in the short term, involves competing economic deals from the European Union and Russia. The Ukrainian state sided with Russia: shortly thereafter, the US-financed opposition erupted. Pallas/Ethics: On the libertarian side, Pallas is parallel Sun and her ruler Venus is conjunct the Sun. On the authoritarian side, Pallas is semisquare Jupiter and one degree from a decile with Pluto. The libertarian factors are strong but somewhat counteracted by Jupiter/Pluto. Overall, the picture is not terrible. Accusations of systemic oppression on the part of this regime may be exaggerated. Venus/Second-House/Economics: A conflicted picture here, echoing the history of the nation. 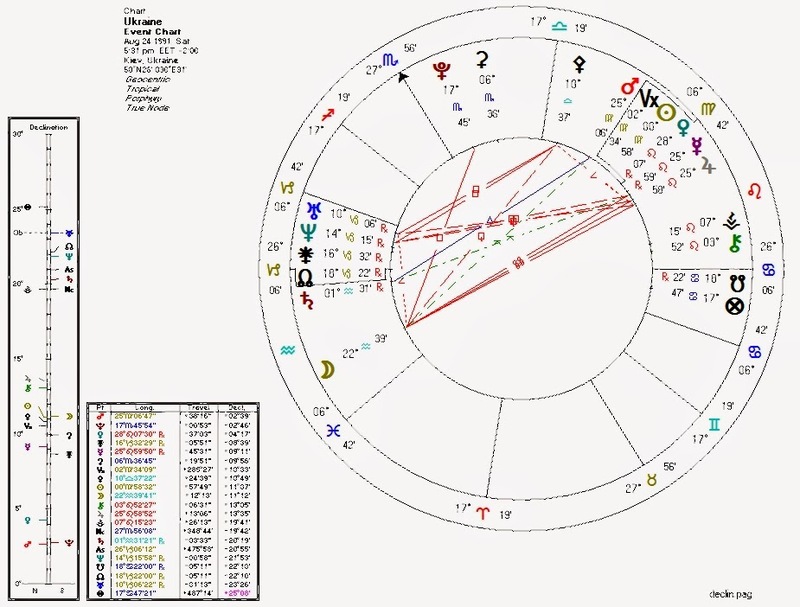 Moving the chart to the economic Left: Venus is novile with the South Node and ruled by the Sun which is sesquiquadate Neptune. An odd but probably capitalist factor is that Neptune, which is conjunct the North node, co-rules the Second House. Ukraine's independence has been marked by the extreme economic turmoil and currency problems we might expect from the Venus/Neptune/South-Node factors. Moon/Fourth-House/Culture/People: Moon co-ruler Uranus conjunct Neptune, Fourth House ruler Venus in aspect to both South Node and Neptune, and South Node in Cancer. This is a strong culturally Left-wing signature, which appears to be manifesting in the form of significant factors moving the country away from its ties with Russia and towards the crumbling cosmopolitan EU. 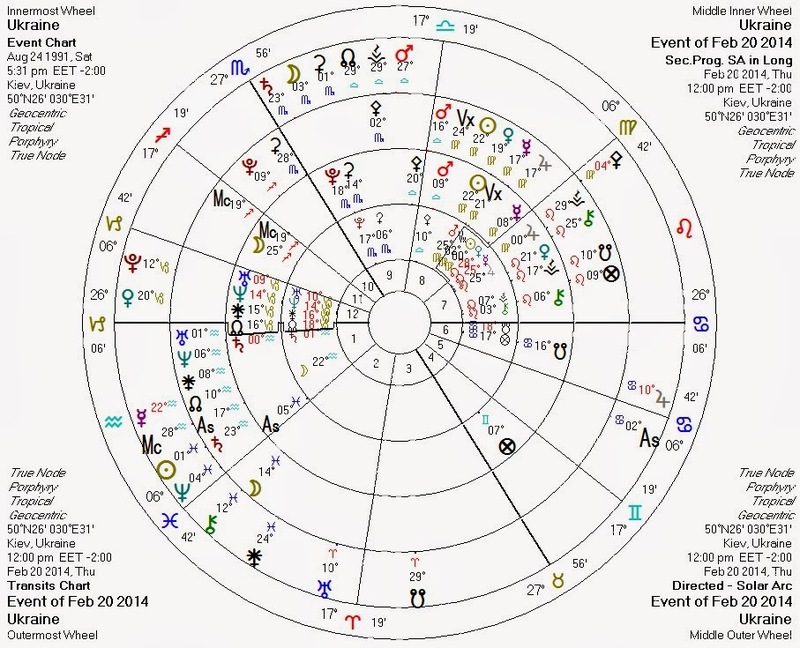 The Moon, representing the people, is under assault in this chart by nearly every other planet. The Moon receives an opposition from the Sun (Ukraine's own leadership?) as well as Venus/Mercury/Jupiter in Leo all in the Seventh House, possibly representing outside (Seventh House) imperialist (Leo) forces including money (Venus) and media (Mercury/Jupiter). Pluto in Scorpio in the Ninth House also squares the Moon: attack from power (Pluto) associated with public institutions (Ninth House) including the more-sinister-than-it-sounds Endowment for Democracy. There's even a semisquare from Uranus (disruptive forces) in the Twelfth House (invisible factors). On top of this, the nodal axis is telling: the South Node in Cancer in the Sixth opposite the North Node in Capricorn in the Twelfth conjunct Neptune. It tells a story of power being drained from the population (Sixth House, Moon) and culture (Moon), to the benefit of hidden (Neptune, Twelfth House) authorities (Capricorn). Solar Arc Uranus conjunct Ukraine Saturn: Disruption (Uranus) of authority (Saturn). Progressed Sun approaching Ukraine Mars: increasing anger/conflict. Progressed Moon trine Ukraine Mercury: people (progressed Moon in the Eleventh) speaking out (Mercury). Progressed Moon square Ukraine Mars: people in conflict (Mars). Transiting Pluto conjunct Ukraine Uranus and Neptune: supercharged (Pluto) disruption (Uranus) and possibly deception (Neptune). Transiting Uranus square Ukraine Uranus: rebellion. Transiting Saturn conjunct Ukraine MC: struggle (Saturn) with authority/government (MC). Transiting Jupiter opposite Ukraine Uranus: popular (Jupiter in Cancer in the Sixth) revolt (Uranus). Transiting South Node trine Ukraine Venus: Venus rules not only money but the Ukraine Fourth House. The season's events may lead to a loss not only financial but of cultural/national identity if they lead to EU integration or foreign intervention. Transiting Venus conjunct Ukraine North Node: this is in the Twelfth House of secrets. It's no great secret that the US and other western powers are bankrolling the increasingly violent protesters. This transit may suggest this and other hidden financial dealings relating to the current struggles.